Roman scholars thought this mythological figure so important that they named a planet and a day (Saturday), for him. Saturn was the god of agriculture, time and celebration. In his honor the ancients even called their festival of merrymaking the Saturnalia, an ancestor of Mardi Gras. The krewe was founded in 1983 and presented its first two processions in the City of Kenner, then moved its parade route to Metairie in 1986. The next year Saturn returned to Kenner, then moved to Orleans Parish in 1993. Since its formation, the organization has been very active in fund-raising for charitable causes. Saturn's past parades in New Orleans has been praised for their wit and style. 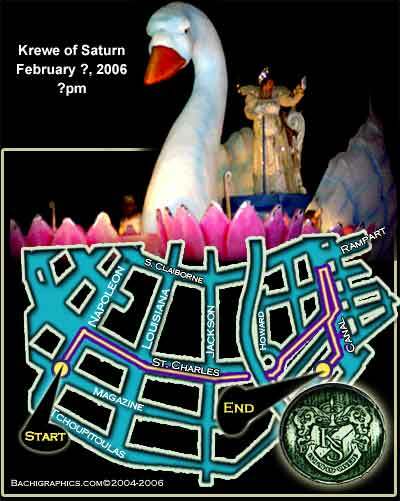 The krewe paraded with 16 floats and 175 members in the 1999 parade. Their throws consisted of silver aluminum doubloons, cups, 2 types of medallion beads and a special "Fat Lady" key chain. The key chain was the highlight and most collectable of the throws.